Welcome back to the latest edition of Web Animation Watch, where we feature the best in animation from across the internet. 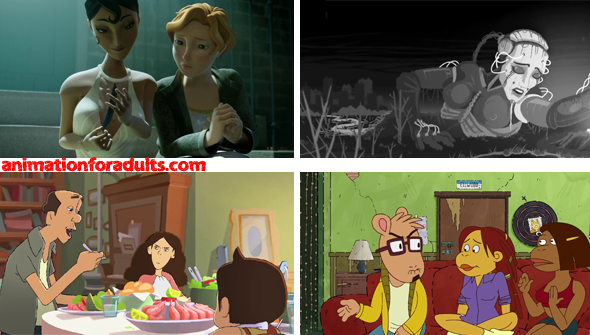 This week, we have some excellent student shorts, some familiar faces and more. If you've created or found something you think we should feature in a future edition of Web Animation Watch then drop us a line today. A young man wanders a post-apocalyptic landscape in this atmospheric short from David James Armsby. This is the fourth part in a series of connected shorts (which includes the previously featured No Monsters) taking place in the same dystopian world. Don't Feed The Freaks works as a standalone, but the others are definitely worth your time, too. This shares the stark monochrome visuals, impressive designs and creepy feel with the previous shorts. It's always fun to see an animated series or film remade in a totally different style. Here, Malec reimagines the hugely popular Adult Swim series Rick and Morty in the style of an anime intro. And it's pretty spot-on and full of great references for fans of both Japanese animation and the series itself. Wub A Lub A Dub Dub! Set in the roaring twenties, this gorgeous student short from a team at ISART Digital sees a young woman become besotted by a glamorous club singer. It's a beautifully made dark fairy-tale, with an all-female cast and a heroine that doesn't fit the typical 'Disney Princess' mould. And the whole thing is done without a single line of dialogue. Tentatrice (2018) from ISART DIGITAL on Vimeo. Speaking of student shorts, this is the first in this year's crop of student films from the prestigious Gobelins school in Paris. Directors Maya Av-Ron, Mylène Cominotti, Marion Coudert , and Dano Sixtine presents the story of a family whose family dinner is disrupted by sudden flooding, in a surprising and smart commentary on climate change issues. It's got a wonderfully organic hand-drawn style which gives it real energy. A new Gobelins short is due to be released every Thursday through until December. Thanks to reader Benoit for the heads up! What would life be like for beloved children's character Arthur when he grows up? According to this short from AOK- not that great. Adult Arthur struggles with adult issues like work and relationships, in this brilliantly made spoof. Not sure about the facial hair, though. The excellent Multiplex 10 Web-series is back, in which Jason and Kurt pit the new Winnie The Pooh movie against the (amazing) Paddington movies. Who will be victorious in the Battle Of The British Bears? Multiplex has (hopefully temporarily) moved to a new channel following some recent issues, losing its subscribers in the process. Be sure to visit and show your support, today- and subscribe so you don't miss future episodes!